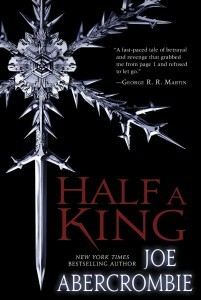 Half a King, by Joe Abercrombie. Del Rey, 2014; reviewed in the hardcover edition. If you’ve read my review of “The Heroes” (see blog archive below), you already know that I’m a fan of Joe Abercrombie’s writing. His seventh and latest novel, “Half a King,” is the first in a proposed young adult fantasy trilogy called “The Shattered Sea,” and though his style is definitely stripped-down and streamlined in this new one to accommodate the YA reader, it’s still a mighty fine read. First, the similarities between “The Heroes” and “Half a King”: both are fast-paced adventures set in low-magic fantasy worlds—in fact, there’s nothing at all that occurs in “Half a King” that requires magic to explain it. Both stories feature northern Viking-like cultures that revere martial prowess, and both involve characters coming of age in the forge of warfare. However, “Half a King” lacks the large ensemble cast of “The Heroes,” focusing instead on the struggles and growth of a single protagonist. Prince Yarvi was born sickly and crippled, missing most of the fingers on one hand, which in a martial culture is a disaster for the son of a warrior king. But he’s a second son, so he makes the best of his situation by pursuing the intellectual tradition of the Ministry, an austere order of sages who act as advisors to the kings and queens of the states around the Shattered Sea. Yarvi is just about to take the test that will fully qualify him as a Minister when word comes of the death of his father and older brother. Suddenly he is the King of Gettland—and that’s when his real troubles begin. He is betrayed, nearly murdered, and falls into the hands of slavers. In mere hours he plummets from the heights of society to its lowest depths, and must quickly learn to cope. The novel is the story of Yarvi’s struggles to somehow recoup his fortunes—if such a thing is even possible. The above events all happen in the book’s first few pages, a breakneck pace that highlights another difference from “The Heroes.” And it never slows down, racing from chapter to exciting chapter, a real page-turner. This is a story leanly told, without an ounce of fat on it, every sentence tight and taut. In fact, at times I wished Abercrombie would slow down and tell me a bit more about the world of the Shattered Sea, but he’s got no time for such indulgences—the reader gets only those details needed to set the scene and define the characters. Those characters are another difference between “Heroes” and “King”—the secondary characters are more simply and sharply defined in this latest novel, drawn with just a few sharp strokes of description and dialogue. Nonetheless each is distinct, each fine-tuned to play out his or her role in Yarvi’s story in as economical a fashion as possible. “Half a King” is not easy to put down as it’s racing along—but on the other hand, it’s not the kind of book I’ll want to pick up and read again five years from now. Everything it has to say it says crisply and clearly the first time through.